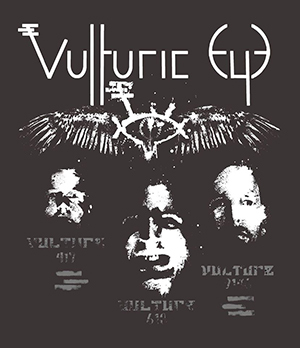 “Know that your efforts, like ours, are worthless.” That’s from the band’s bio that came with the three-song CD, Vulture Manifesto, by Vulturic Eye. Listeners may note that the British three-piece band leans on older progressive metal, and the singer, it sounds like, has a bit of influence from Michael Kiske of Helloween and Bruce Dickinson maybe. The band writes “There is no need for recognition (that fruit has long since soured)” in the bio, but still: these musicians are ambitious! The record is on Bandcamp, CD, and the other usual digital platforms like iTunes and Spotify. This band deserves a listen. This entry was posted in Reviews and tagged progressive metal, UK, Vulturic Eye by Editor. Bookmark the permalink.